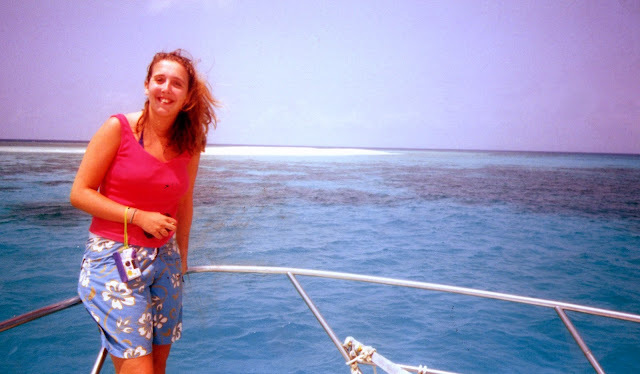 On board the boat after my amazing Great Barrier Reef snorkelling experience. 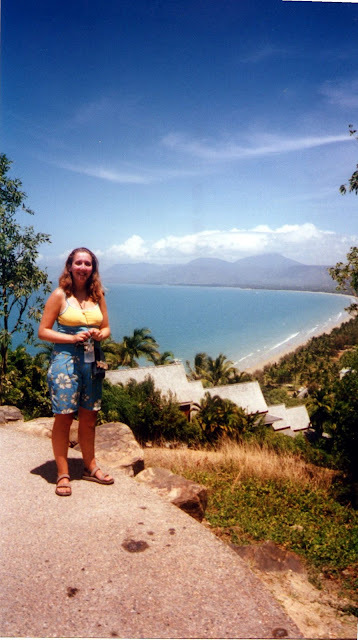 After my brief stopover in Tennant's Creek, my journey took me to Port Douglas via Cairns. I went out with a few from the hostel to a pub in the city by the water and made the ultimate traveller's nightmare mistake. I left my passport with the bar owner (as they needed it for my bar tab) and the next day my coach was leaving at 11am. I did not realise until the last minute and had to panic dash with all my luggage down to the pub. I then discovered the pub was closed until 11am and I had to knock on lots of doors. I was in a real old panic. Never leave your passport anywhere, big no no! Keep it on you at all times. So beyond the panic of Cairns I arrived into the very beautiful Port Douglas. Port Douglas is the only place in the world that has two World Heritage Sites right on its doorstep. Daintree and Cape Tribulation rainforest and of course one of the great wonders of the natural world, The Great Barrier reef. By the time I arrived in Port Douglas I was getting low on funds again and knew because of my visa I did not have time to get work anywhere without missing out on the travelling aspect of my journey. But fortunately, those good ole credit companies raised my credit limit and I was able to continue my experience. In Port Douglas I stayed at Dougies Backpackers. It was an easy-going hostel and had a lovely outdoor space. I even had an enjoyable evening watching England and Germany play football on TV outside (not into football) and thoroughly enjoyed the experience. Next time I travel I will make sure I photograph all the delightful food, mouth watering just thinking about it. After dinner we wandered into a local pub and watched snail racing (hehe!). Lots of people betting on which snail will cross the finish line first and it was hilarious. I have never ever seen this kind of racing before, and those snails, they are not as slow as you would imagine (grin!). Onwards from Port Douglas I travelled the short journey back up the east coast to Cape Tribulation ,a World Heritage Site and an area of amazing outstanding beauty. Instead of the usual hostel, I stayed in budget cabin-style accommodation. 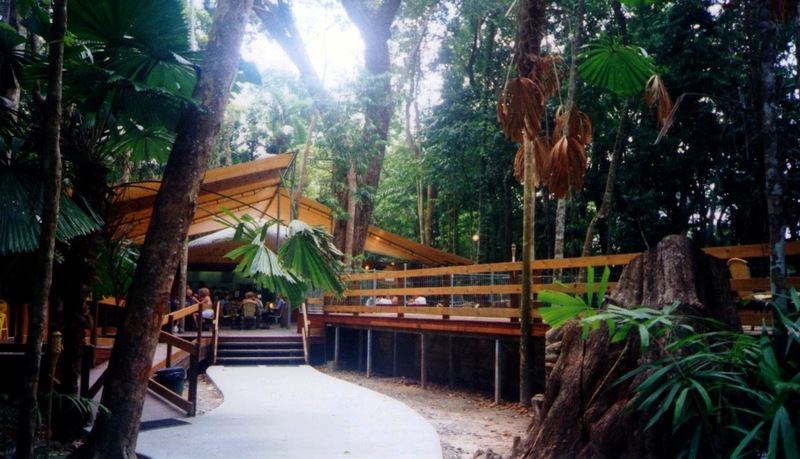 It was called Cape Tribulation Beach House Resort. It was such a wonderful place to stay I will definitely stay much longer if I go to Cape Tribulation again; not enough time to soak in the atmosphere. And looking at the website the range of activities available to travellers has increased and it would be even better than before. The Beach House resort caters to people on all budgets from dorm-style bunk cabins to double cabins, beach front apartments and luxury accommodation, all air-conditioned. I stayed in one of the bunk-style cabins. My walk up to the eating area and bar. Also a wonderful place to sit and check the internet. 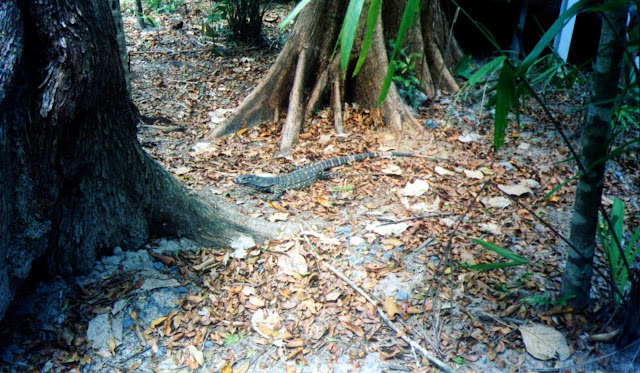 On my way to eat at the outdoor bistro seen above, I would come across huge lizards. To live in the rainforest and be by one of the great wonders of the world (The Great Barrier Reef), was awe-inspiring. I am so keen to go back to Australia some day and photograph it in a far better way. My skills were lacking back then and my creativity a lot less. One of the many creatures I came across on my trip. 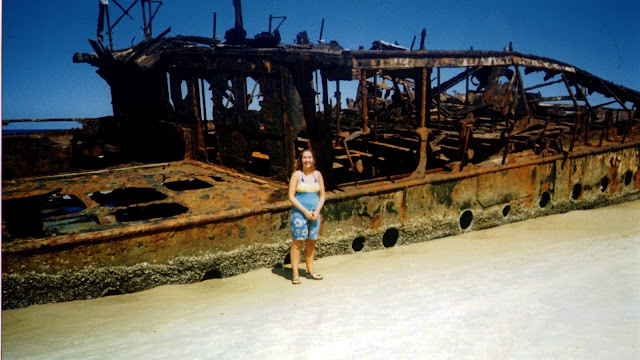 While at Cape Tribulation I did one of my big all time dreams, I snorkelled The Great Barrier Reef. 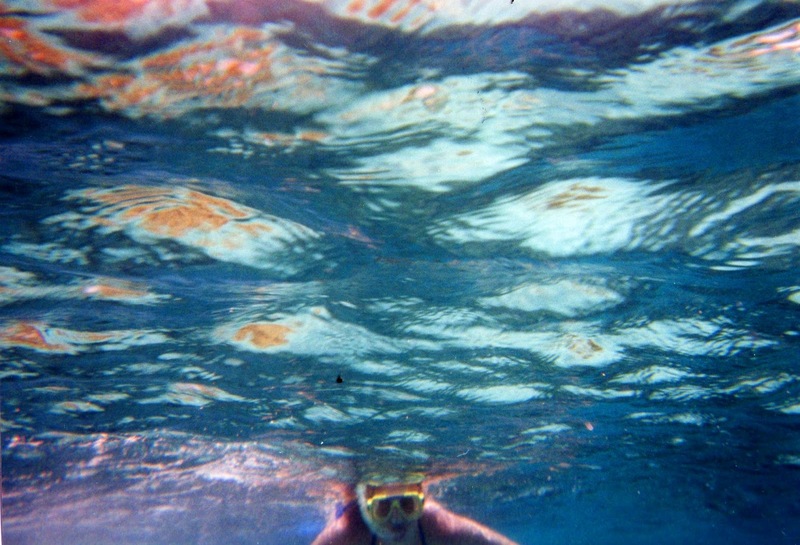 I have not really snorkelled apart from that brief time on the West Coast of Australia and this was heaven. The company I went through were very safe, told us what to do and not to do, I was a little nervous as we were out in open water and it was a little choppy. For those of us a little nervous they had a floating ring out to hold onto to begin with until we gained our confidence out on the reef. 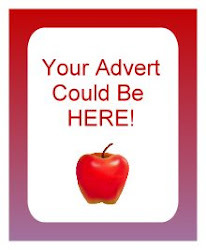 I did and I saw a turtle, a sea-snake, a ray and the most glorious coloured fish imagineable. And let's not forget the beautiful reef with its miriad of colourful coral. We had to be extra careful when snorkelling so as not to disturb the coral but I recommend this trip so much to anyone visiting the east coast Port Douglas/Cape Tribulation area. If I remember back, there were trips leaving Port Douglas for the reef but the boats coming out of Cape Tribulation were limited so possibly more eco-friendly and quieter out on the ocean wave. I think the company I went through are no longer there or have changed their name but here is a list of good companies also. 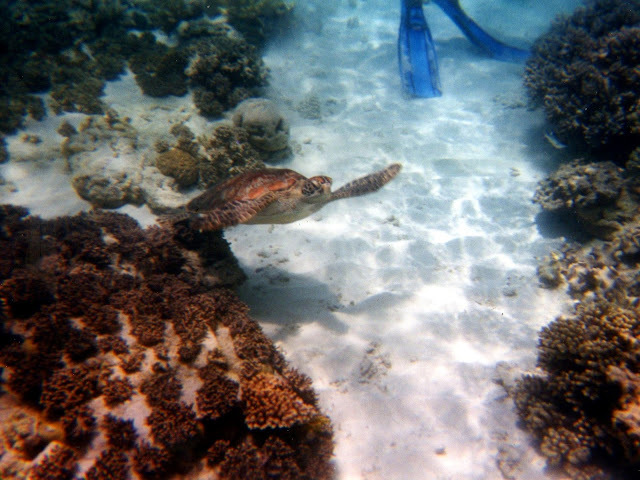 Say Hi to the turtle waving! Due to time restraints with my visa, I did not spend as long in Queensland as I would have liked, but I did have some wonderfully peaceful and very relaxing times. One of my favourite places I stayed in on the whole of my trip was a place called The Sanctuary Retreat at Mission Beach. It was reasonably priced accommodation and I had a double room to myself. I say double room but it is incredibly unique accommodation. See below to see why. I was on my own, quite distant from the Longhouse dining area. It was a brilliant structure and very environmentally aware. At night I could hear the toads singing in the forest after the rain. All I can say is, it was out of this world! Other than fantastic accommodation, The Sanctuary Retreat had a fabulous chef. The food was divine, home baked and local produce. They cater very well to vegetarians and it was like dining at a top class restaurant each day. 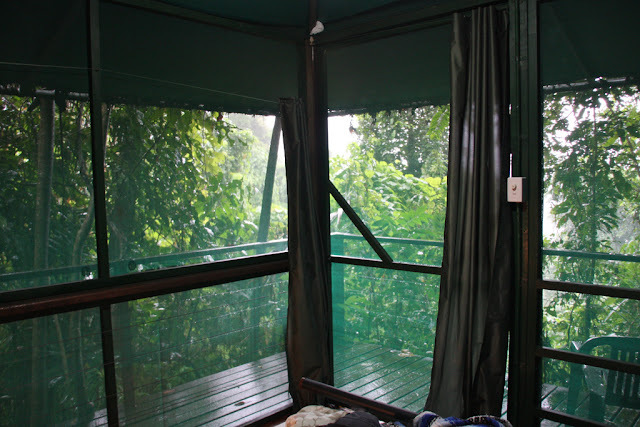 The Longhouse (where the dining area was) gave you panoramic views of the forest and you could sit on the long balcony overlooking the forest and enjoy your breakfast or evening meal there. At night I saw tree frogs on the window and during the day I spent some time sitting, admiring the view, in this place of serene and absolute beauty with huge blue butterflies tantalising my visual senses. Here is a sample current day menu of what they have to offer if you stay. Right now breakfast, lunch and dinner sounds heavenly! roasted pinenuts, salad greens and more...the best salad for miles). vodka & lime beurre blanc on a bed of spinach with potato mash. lemongrass, ginger, sweet chilli and mushroom soy sauce. with lemon myrtle scented rice and wilted greens. vinegar, honey and a hint of chilli. The Sanctuary Retreat also serves a selection of coffees, smoothies and healthy refreshing drinks. And if you are there for a real chill-out time they offer massage therapy and yoga classes. 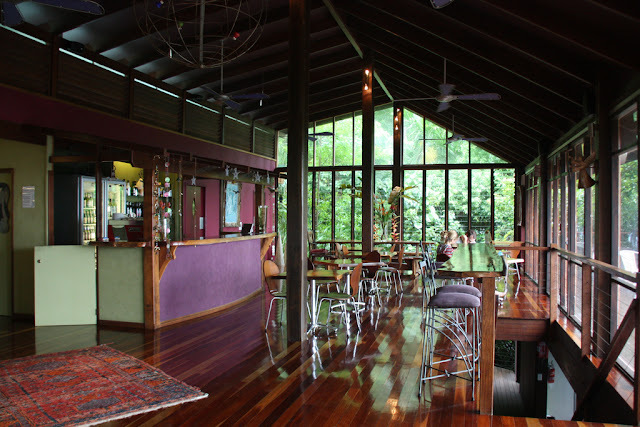 In the Longhouse, if you are there on your own you can either chat with fellow travellers or they also have a fantastic music selection of totally wind-down chill-out music and a great selection of books to browse through. I still have fond memories of sitting in the Longhouse at night reading or chatting with a couple that were also staying there while Moby played in the background. These are the memories to be cherished when travelling. It's not all high-octane energy action but it's the quiet moments that you remember, when you realise you have landed fully into who you really are. 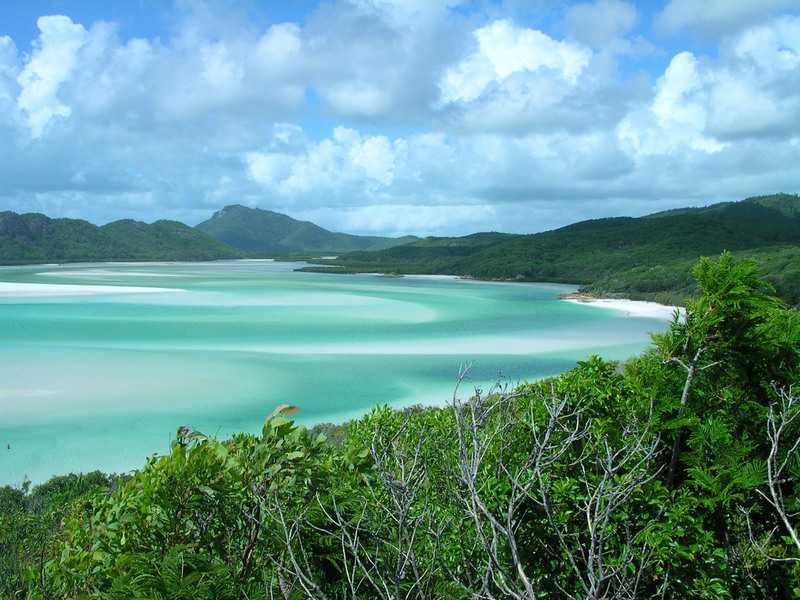 After my very serene stay at the Sanctuary I moved further down the coast, parked my behind in Brisbane overnight, and then took a tour of the Whitsunday Islands. And while these islands are phenomenaly beautiful and a lot of people rave on about them, I do feel I preferred some of the more secluded beaches of the West Coast. However, the sand was a beautiful crisp white colour made from white silica instead of your normal sand. Because of this there were no roaring waves blanketing the beach. Instead it made a rather beautiful Shhhh.... sound as it came onto the sand. The sand is perfect for cleaning jewellery and makes the skin lovely and soft (random fact!). The Whitsunday Islands are exactly what you imagine a tropical paradise to be and all set inside the beautiful Great Barrier Reef. After the Whitsundays I had a day trip out to Fraser Island a World Heritage listed site. Beautiful beaches and over 100 freshwater lakes. 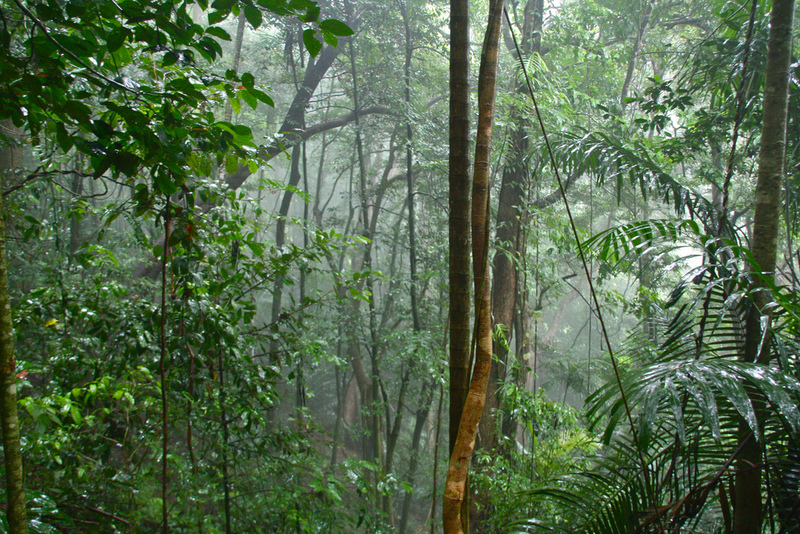 It is one of the only places where the rainforest is growing on sand dunes. An island for nature lovers and ecologists, bird-watchers and anyone that loves a haven for wildlife. 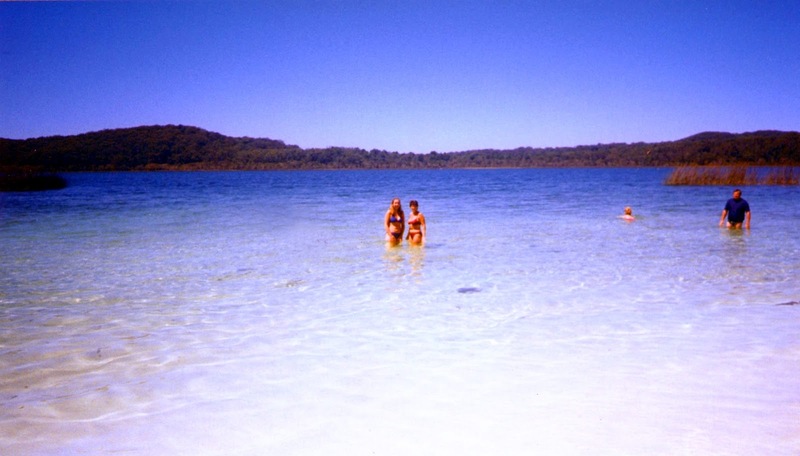 One of the wonderful freshwater lakes on Fraser Island. Moving on from my tour of Queensland I went down the east coast I went. I stayed for a week in a town that I could quite happily emigrate to. I felt very at home, it was like a rather sunny and warm Glastonbury. 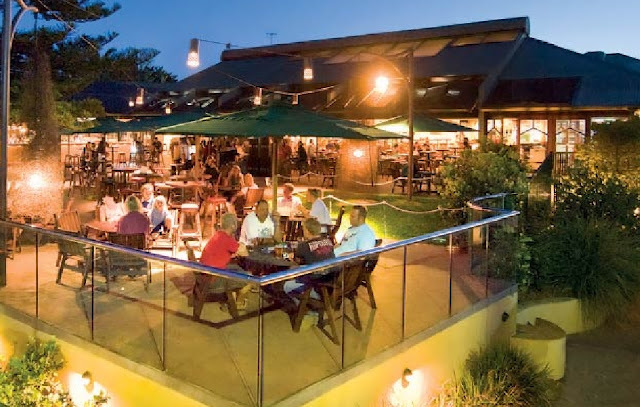 It was the new age, yet also wealthy town of Byron Bay. I say wealthy as it has a mix of travellers, hippies, new agey types and it is a place where many wealthy people move to. Picture vegetarian cafes galore, blues festivals, music, flowing long skirts, crystal shops and surfing, and you will get the idea of Byron Bay. Furthermore, since Melbourne, I had spent the remaining portion of my trip discovering more about life and the bigger picture. I learned how to meditate, self heal and I just became a great questioner of life and why things happens. In Byron I booked myself in for a deep tissue massage and a session in a flotation tank. Yes, I immersed myself in the whole Byron Bay experience. The massage was the best massage I have had in my life so far. The massage couch had one of those extending head holders so you did not feel squashed inside a small hole inside the bed and the massage sent me into a dream. I finished the experience by going into a flotation tank. Now, flotation tanks are not for claustrophobic people, and I never considered myself claustrophobic, but I must admit I did have a few panics inside there. Even though you are totally held by shallow salt water, the enclosed space made me feel like I could not breathe, but that soon passed and it became a really relaxing experience. One recommendation though, check yourself for any minor cuts or scrapes. If you have any, the salt will go into them and you certainly do feel it. Other than massage and floatation experiences I also had my aura photographed (the aura is the energy bubble around you - kinda a protective light that also interacts with the world around you - best way to explain it to those who may not know what it is). Byron has great bars and outdoor eating areas by the beach and what a lovely beach. One thing I did not try when in Australia, which I would like to try now as I have more courage, is surfing, but I got to watch them while I had my lunch. Byron Bay is one big community and I found it very safe. I walked to a crystal warehouse one day as I had this strange hippy thought when travelling that I would open my own crystal new age shop back in the UK (realise now it was a bit of a dreamy idea not really something my heart wanted). I left the warehouse and realised I had to walk back in peak day heat over an hour and had very little water. A guy pulled over and offered me a lift - and I took it!! EEEK!! But all was well, I had it in my mind that he was okay as he had a sticker in his window that said 'Protected by Angels' (don't laugh! he he I had turned into a real hippy traveller by then - surprised I was not saying the word 'dude' a lot - grin). And trusted my intuition, but now I think I would be a little more hesitant and better organised when travelling. All of these experiences are part and parcel of the travelling life. You experience the world differently in your early twenties to your thirties and beyond. One of my last stops on my trip was Coffs Harbour. My coach stopped over at the service station for lunch. I was wearing a rose quartz crystal and was still learning all about crystals and healing while reading a book by James Redfield called the Celestine Prophecy. While waiting in line to buy some food, a rather good-looking man strolled over to me - he had blonde hair and said, pointing to my necklace "Rose quartz, self love and you do Reiki." 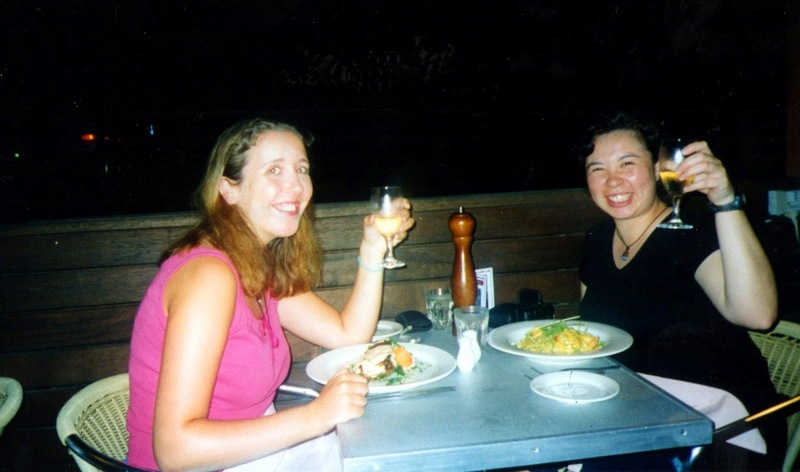 I was gobsmacked to say the least as nobody knew I did Reiki apart from Melinda in Melbourne. He also said he was told by one of his spirit guides he would meet an interesting lady for a short time that day. Well me, romantic twenty something Kelly blushed, and eagerly went with him. We sat down for lunch and he told me about a technique called NLP (neuro linguistic programming). At the time I did not know what it was about but he was telling me it would help me with the negative thinking I was plagued with and self esteem stuff. I think we had about 15 minutes together. He touched my hand and I felt electricity come through me. His name was Rodney and he was originally from Newcastle in Australia. We left one another at the bus depot, hugged as we got onto different coaches (I could of kissed him to be honest the electricity was amazing!) and I never saw him again. Crazy ole romantic me has been known to on the occasional net search to try and find him, but alas, no Rodney has surfaced, but who knows, maybe some day. And so I stayed one last night in Sydney, boarded my flight home and welled up with a whole lot of tears. I did not want to leave. I was happy to stay in Australia but my journey had to continue as my visa was running out. I arrived back into Newcastle to a tearful family reunion. I was home but not truly home, as my heart lies on the open road. *Please note any reviews are based on the year 2000 experiences, accommodation may have changed, or not, please check out tripadvisor for more recent reviews. Wow I never knew you travelled! and let alone to such beautiful places and ate some scrumy sounding foods!! Inspiring i would love to travel one day :) i have done things a bit backwards and had children first. Thanks Amelia, yes travelled, but its definitely time to travel again these feet have been itchy for too long lol! Now you know why I was so passionate about travel :-) And you know, you have time to travel, as I plan to start now, and I am in my middle thirties. In addition there are a number of companies that cater to families travelling together... you have inspired me with a new blog post for next week... thank you!